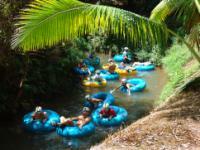 Kauai Backcountry offers amazing and fun Kauai Tubing activities for you to participate in during your Hawaiian vacation. While Tubing the Ditch in Kauai, you’ll be able to check out incredible engineering feats while cruising down a waterway consisting of tunnels, flumes, and open ditches that were hand-dug in approximately 1870. When you book your Kauai Backcountry Tubing activities through Top Ten Hawaii, you’re sure to save both time and money. Kauai Backcountry offers premier Kauai Tubing Adventures. Float through the Hawaii Tubing underworld with the light from your headlight to show the way when you enjoy Tubing the Ditch Kauai. At the end of the Kauai Backcountry Tubing expedition, you’ll be led to a majestic picnic area for a memorable picnic lunch near a refreshing swimming hole. Kauai Backcountry Tubing includes cruising down Lihue Plantation’s tunnel system and irrigation ditch. You’ll be able to check out a water system that, up until 2000, irrigated sugar crops on the island. This Kauai Tubing system takes you through some of the most stunning areas with fantastic vistas of the coastline, ocean and valleys. The ditch and waterway system starts close to the top of the wettest spot in the world, Mount Wai’ale’ale, and twists through rushing flumes, mysterious tunnels, and open canals. Kauai Tubing Adventures give you the opportunity to see some of the island’s most beautiful sights. Hawaii Tubing is equally fun for a romantic couple that wants to take it easy and the whole family. It was a win-win for everyone involved once an alternative use for the outdated irrigation system was found. It gave Kauai Backcountry the chance for a terrific business opportunity, the plantation with sufficient to keep the irrigation system in good and current operation, and the consumer the opportunity to enjoy all that Tubing the Ditch Kauai has to offer. The tranquil waters of the irrigation system create a Kauai Tubing activity that’s ideal for any and all fitness levels. When you’re booking your Hawaii vacation through one of the quality sites here on Top Ten Hawaii, don’t wait to book your Kauai Tubing Adventures. This is a popular Kauai activity and advanced reservations are a must!